Having a diverse line of firearms products for personal and training uses can be challenging as needs among the firearms industry are ever changing. That is why Action Target continually creates new products and forms partnerships with the top companies in the firearms industry. To help educate our customers about all Action Target changes, we recently released new catalogs showcasing our new products and partners. At Shot Show 2011, Action Target received thousands of visitors to our booth. The size and impressive layout of our booth were not the only things that caught people’s attention this year – the introduction of many new products and partners took center stage during this year’s show. One of the most popular products this year was the Hufcor Flex Tact reconfigurable shoothouse technology. Great for law enforcement, military, and firefighters, many people were able to experience this innovative training tool firsthand through actual demonstration. The Action Target Portable Target (PT) also unveiled some new product lines. Prior to the Shot Show, Action Target partnered with Reactive Target System (RTS), making us their exclusive worldwide product distributor. Some of the many benefits of the RTS system include the ability to use the targets for close quarter live fire trainings, to the ability to count every round on target with the Mobile Wireless Shooting Range. 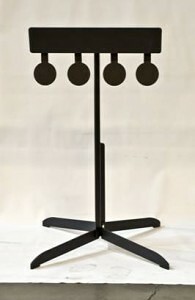 For more information about Action Target’s full line of products and services visit our web site, www.actiontarget.com. To purchase Action Target products for drop shipment direct to your U.S. range or facility, shop online at www.shopactiontarget.com . For all other range-related needs, visit our subsidiary website at Law Enforcement Targets. For the past two years, Action Target has been the official target supplier for the youth shooting program, Scholastic Steel Challenge (SSC). “We’re very pleased to have Action Target as our official target. Not only have they provided us with an excellent promotional target package that clubs can manage, they are also bringing their 20-plus years of range and target expertise to the aid of coaches and clubs to make sure our kids are competing in a safe and fun environment,” said Scott Moore, director of SSC. We are one of many companies that play an active role in the success of the Scholastic Steel Challenge event. Other supporters include The National Shooting Sports Foundation (NSSF), Smith & Wesson, and the Outdoor Wire Digital Network—all have provided significant amounts of funding and shooting products in support of this event. “Action Target is very excited about the Scholastic Steel Challenge and the expansion of the pistol shooting sports it represents. We’re proud to be part of this growing, industry-wide effort to bring new shooters into the world of competition shooting and we look forward to working with ranges and teams all across the country,” said Chad Burdette, Portable Target consultant for Action Target. The Scholastic Steel Challenge is a national team-oriented youth shooting program developed by the Steel Challenge Shooting Association (SCSA) and is partly funded by a grant from the National Shooting Sports Foundation. This program is open to young men and women ages 12 to 20 and offers the opportunity for a four person team to compete for the national title in the Action Pistol Discipline of Speed Shooting. The SSC competition is a family sport of “speed steel” designed with an supportive environment taught by trained adult coaches who focus on the safe handling and use of handguns. The SSC competitive format is based on the Steel Challenge, the nation’s most successful handgun competition. We adapted the competition format to provide an enjoyable, safe, and action packed competition for both beginner and experienced shooters. This year, Action Target is offering a discounted steel target package for teams and ranges participating in the program and will provide technical support during the question and answer section of the program’s website. This allows the opportunity for company experts to assist ranges and teams in their efforts to expand shooting opportunities. If you have questions regarding the target packages offered at discounted rates for SSC affiliates, please contact Chad Burdette at chadb@actiontarget.com for more information. For more information about the Scholastic Steel Challenge, please visit their website. On June 3, 2010, Action Target became the only shooting range development company in the world to produce a weekly newsletter, called The Action Target Journal. Accomplishing this challenging task created a new innovative source of information about superior products and special pricing on targets exclusively available to our subscribers, as seen in our ‘Steel Deal’ section. For the last 52 weeks, without disruption, our newsletter has been published to an ever-growing list of subscribers. After launching our first newsletter, Action Target quickly gained over 15,000 civilian, law enforcement, and military readers. Now at our one year mark, our list of readers has more than doubled. 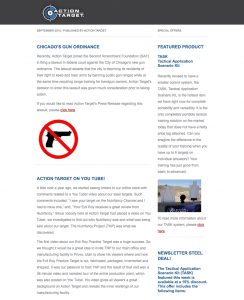 The Action Target weekly newsletter has definitely caught the attention of the firearms industry. Despite the many requests to purchase advertising space by industry related companies, firms, and organizations, our readers will never see their advertisements in our newsletters. “Action Target previously adopted several different forms of a newsletter, but the formats did not fully support the entire world market that makes up the shooting industry. After discussing the matter very candidly with many of our clients, it was obvious there was a need not being met. So, we put together a very ambitious plan for a weekly newsletter that would properly address the items that encompass the aspects of the shooting world desire from Action Target. To date, we have received thousands of positive comments about our weekly newsletter in addition to the hundreds of times it has been republished,” said Chad Burdette, Portable Target sales consultant. Action Target’s weekly newsletter continues to evolve since its first publication. It went from a static publication to one actively soliciting feedback from our readers. The received feedback resulted in strategic partnerships, as seen with Hufcor and their FlexTact reconfigurable shoot house and Reactive Target System (RTS) for their Self-Healing Targets and economical Mobile Wireless Hit-Counting system. To subscribe to our weekly newsletter, The Action Target Journal, click here. For Action Target’s full line of products and services, visit our website, www.actiontarget.com. To purchase our products for drop shipment direct to your U.S. range or facility, shop online at www.shopactiontarget.com . At Action Target, we know budgets are tighter more than ever right now. We also know that training needs have to continually change to avoid complacency. To help ease the burdens these factors place on the training industry, we are excited to announce our Target of the Month program. The Target of the Month program offers one of our portable target systems at an unbelievable low price to our newsletter subscribers. The discount price lasts the entire month that the specific product is advertised, so be sure to place your orders early before the month ends. There is NO LIMIT on the number of products ordered. To kick off this program, we are featuring our PT Hold (Set of 3) Package . This package includes three target bases that utilize 1” x 2” strips of wood and provides a superior stable platform for you to mount targets onto. Regularly priced at $199 for the three-pack, this program allows you to purchase all three PT Holds for $150. This offer is now available through June 30, 2011 at our Action Target online store, www.shopactiontarget.com , by entering the coupon code HOLDUP3 upon checkout. When priced individually, these target systems cost about $1800, but through the Newsletter Steel Target Package, you only pay $1,500. To purchase these systems, add the Steel Target Package (AT Hostage, Dueling Tree AR550 & Plate Rack Package) to your shopping cart and enter the coupon code STEELSPECIAL2011 upon checking out to receive your discount. Action Target is selling its existing inventory of all paper, cardboard, plastic and foam targets and backers at a discounted rate for newsletter subscribers, available through the online store. This offer will run the entire month of May. After the sale is over, we will be moving our inventory to Law Enforcement Targets. These prices are ONLY available through the Action Target Online store . If orders are placed with Law Enforcement Targets, you will be charged full retail price. No coupon code required; discount automatically given upon checkout. Please note: Action Target will continue to inventory and sell the 3D cardboard targets and the cardboard target holder used for indoor shooting range retrievers, even after May.